Multiple restaurants a full spa two pools and a marina are welcome features at the non-smoking Chateau On The Lake Resort Spa located minutes from popular destinations in Branson. The non-smoking Chateau On The Lake offers 358 rooms on ten floors with lake or mountain views beds with triple sheeting and down comforters flat-panel TVs pay-per-view movies coffeemakers and Wi-Fi for a fee. Guests love to be pampered with body treatments at the spa perhaps after a workout in the fitness center or a game of tennis. A seasonal outdoor pool an indoor pool and a hot tub provide relaxation. There are several restaurants including an American grille with an extensive wine list and a cafe with patio seating. The resort's marina offers motorized water vehicles canoes paddleboats and kayaks for rent. Pets are allowed for a fee and parking is free. 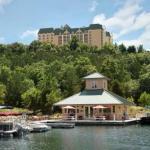 Located on State Highway 265 Chateau On The Lake faces Table Rock Lake. Pointe Royale Golf Course is two miles east and Table Rock State Park is three-and-a-half miles south. The hotel is 10 miles from downtown Branson and six miles from the Branson Theatre District the Titanic Museum White Water Park and 90 Outlets shopping center. Branson Airport is 15 miles away and Tulsa International Airport is less than 200 miles southwest.